Dennis Public Library: Concerned about your driving skills? Concerned about your driving skills? AAA's DriveSharp is here! This training program software will help you think faster, focus better, and react quicker on the road. The Installation CD is available at the Circulation Desk. Bring it home and load onto your computer. 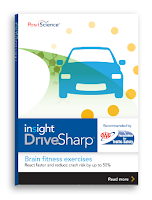 Its brain fitness exercises will strengthen your brain's ability to process what you see - so when you're driving, you can react faster. And when you're not, you'll still be sharper!